What Is a Good Way to Get Rid of Hair Without Shaving? Depilatory creams remove unwanted hair without pain. While applying your daily makeup or prepping for a trip to the beach, you may be caught off guard by peach fuzz. The fine layer of hair that covers all skin is darker on some people than others. It is usually discreet, but catches the light when coated with makeup and other skin-care products. While at times inconvenient, it doesn't call for a wax session or an extra can of shaving cream. Smooth on a depilatory cream that dissolves surface hair for a fuzz-free finish that will last about a week. Take a warm shower and work a moisturizing body wash into your skin before rinsing well. 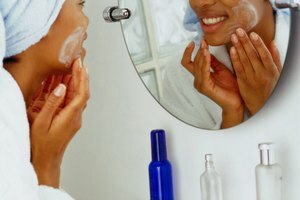 If you are removing hair from your face, wash your face with a moisturizing face wash. Pat your skin dry with a clean towel. Soft, moisturized hair is easiest to remove. Apply a thin layer of depilatory cream to the hair you'd like to remove. Start with a quarter-size amount if working on body hair and a dime-size amount for facial hair. Use a cream intended for the body part you are working on to avoid hypersensitivity. Allow the cream to sit on your skin for the amount of time indicated on the product's packaging. This is typically between 5 and 8 minutes. Wipe the cream from your skin using a clean tissue, and pat aloe-vera gel on the area to calm inflammation. Avoid applying cosmetics to the skin for at least 3 hours after hair removal to prevent irritation. Try to remove hair at night to give your skin time to heal while you sleep. Do a patch test by applying the depilatory cream to your arm or leg before more sensitive areas, such as your face or bikini line. If any irritation occurs, select another product to use. Celeigh O'Neil has been writing professionally since 2008. She has a Bachelor of fine arts from the University of Ottawa, as well as degrees in fashion illustration/design, digital arts and certification in hair and makeup artistry. O'Neil was a frequent contributor to Toronto's "Dialog" newspaper and has worked as an instructional writer, creating lessons in fashion, art and English for students of all ages. O'Neil, Celeigh. "Peach Fuzz Hair Removal." Synonym, https://classroom.synonym.com/peach-fuzz-hair-removal-21174.html. Accessed 20 April 2019. Should You Use a Silicone-Based Primer If You Have Oily Skin?